Due to the poor results obtained from synthetic ACL replacements, the current direction of tissue engineering is focused primarily on biological materials. After all, the ACL is a biological element and is a complex system of cells, proteins, and signaling factors that cannot be replaced with just a synthetic scaffold. Several strategies are currently being developed to determine optimum ACL replacement materials. In general, tissue engineering incorporates a scaffold with a mixture of cells, proteins, and growth factors, where it can then be grown ex vivo or implanted directly in the body to regenerate or repair tissue. There are several characteristics of an ideal ACL scaffold: biocompatibility, biodegradability, ample mechanical strength, and the ability to support cell growth. There is currently no engineered biological graft on the market, but several promising designs have been developed. One method of obtaining biological scaffolds is known as the acellularization process. In this method, an intact ACL is harvested from human cadaver donors and all cells from the tissue are removed. 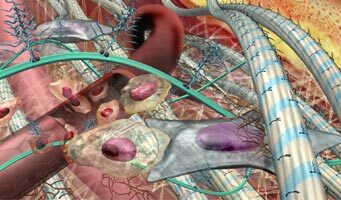 Elimination of the cells removes the risk of an immunological response, and the accellularized graft can now be used as a scaffold. Fibroblasts from the patient’s own damaged ACL are seeded onto the acellularized scaffold and allowed to proliferate and become situated in the graft. Fibroblasts function to resorb and organize collagen during tissue healing and remodeling. This ‘living’ graft takes advantage of the combination of cells capable of self-remodeling and a scaffold with near identical mechanical properties as the original ACL. This graft is an improvement over previous synthetic grafts in that there are no issues with wearing and forming of inflammation-causing particles, the use of autologous cells reduces the risk in graft rejection or infection, and the natural scaffold better represents the strength of natural ACL. Other natural materials considered for ACL replacement are collagen fiber-based scaffolds. Type I collagen is a major component and contributor to the strength of the ACL and has been used in many recent tissue engineered designs. Some advantages to collagen are that it can easily be extracted from tissue and formed into thin, yet strong parallel fibers. Collagen can be resorbed by the body without creating inflammatory debris, and the degree of resorption can be controlled by amount of crosslinking in the collagen. Preliminary results from collagen scaffold implantation in rabbits have shown that the graft had initial weakening, but with tissue ingrowth, was able to regain some strength similar to that of autogenous grafts. The more the scaffold is resorbed and replaced by new tissue, the stronger the graft becomes. However, various groups have had inconsistent tissue growth on collagen scaffolds, which failed to reach comparable strength to native ligament. However, a scaffold and cells alone cannot fully replace an ACL. More complicated systems of specially selected cells, growth factors, and a source of mechanical loading are needed to improve graft functionality and strength. This system should contain cells capable of proliferating and remodeling the implanted scaffold, a scaffold that promotes cell adhesion and growth, and an environment that provides ample supply of nutrients and growth factors. Development of this scaffold can be done either in vivo or ex vivo. In an in vivo system, the scaffold is implanted into the host, and may be seeded with cells, but is designed such that it promotes tissue growth within the patient. In an ex vivo system, a bioreactor is used to mimic the physiological environment of a normally healing ligament, and completely grow a ligament prior to implantation in the body. Much research in tissue engineering today is focused on optimizing the parameters that go into these two types of systems. One such parameter is the growth factor. Fibroblasts are important in collagen synthesis and remodeling, but one main disadvantage is its limited lifespan. A new cell source of interest is the bone marrow stem cell (BMSC). These cells provide a renewable source of fibroblast-like cells. Altman et al. recently showed that by placing BMSCs in a bioreactor that places torsional and longitudinal strain on the cells, they found that the cells formed oriented collagen fibers. Not much is known on what factors influence a stem cell to differentiate into a particular cell. Current research has found that BMSC differentiation toward a fibroblast phenotype can be influenced by different combinations of growth factors and media such as EGF and TGF or bFGF and TGF. Future studies on the exact temporal release of growth factors and other physiological conditions will need to be examined further in order to optimize the use of stem cells. 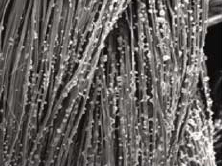 Silk is another natural material that has been considered a suitable candidate for ligament engineering. It is biocompatible, has known biodegradable rates, and can be formed with modifiable mechanical properties. Altman et al. 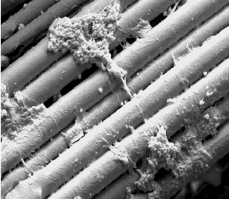 wove bundles of silk fibers into fibrils which were then woven further into cords to form a ‘wire-rope’ scaffold. This scaffold was seeded with human BMSCs and with a bioreactor, was placed under cyclic rotational and translational strain to promote formation of collagen and important growth markers. The induced mechanical loading has been shown to recreate structural changes similar to those of normal fibroblast-like cell differentiation. The group also showed that the surface of the scaffold could be modified with cell-binding polypeptide sequences, such as arginine-glycine-aspartic acid (RGD) to promote cell adhesion and proliferation. The importance of exposing ligament fibroblasts to stress during development has encouraged tissue engineers to incorporate mechanical stimulation into the growth of engineered ACL grafts. It is believed that mechanotransduction signals are transmitted throughout the cell to direct cell activity and organized tissue assembly. 2) Scaffolding should provide sufficient strength, structural support, and should be able to promote cell growth and remodeling in vivo. 3) Efficient bioreactors that can generate the necessary physiological and mechanical conditions to create grafts which are functional prior to implantation. Currently, researchers are looking towards stem cells as a renewable cell source which can be easily obtained by needle biopsy and differentiated and proliferated in vitro. Also, a number of different biodegradable scaffolds such as silk and collagen have been designed with specific structures, mechanical integrity, degradation rates, and cell adhesion surfaces. 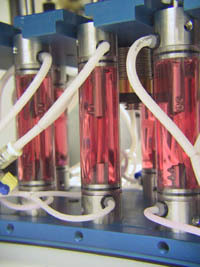 Many bioreactors have also been developed with control over release of certain factors and with the ability to induce strategic mechanical loading. However, these three components still require much more work. The advances in tissue engineering today show definite promise and are encouraging that a successfully engineered ACL replacement is in the near future.